G-Whizz! for iPhone / iPad: G-Whizz! Now Available! Before purchasing the app, I would like to know if pressing on a contact's name on the Google Voice screen from the iPad will trigger a call on a registered GV number? It doesn't work on Google's own HTML5 page from the iPad. Unfortunately, not yet. It works fine on the iPhone. The problem is that Google's HTML5 page expects the device on which the page is being displayed to be a phone. The iPad can't interpret phone links. I'd like to investigate ways to make this work on iPad. As a temporary work-around, you can click on the link at the bottom of the HTML5 Voice site that says "Desktop version." This version will make calls correctly on iPad. Perhaps it would be useful to have a setting to default to the Desktop version for iPad? Before purchasing, what happens when I click a link in gmail? Does it open a new tab or window? Thanks. Carlo, new links in Gmail open up in a pop-up window that you can then dismiss when you're done. I hope this helps. Ricky, this app was recommended to me by a person I follow on Buzz. I use Gmail a lot on my iPad and in Safari, sometimes there are message scrolling issues in the right pane, where I try to scroll through the message, but it ends up scrolling the entire screen, making it impossible to see more of the message. Also, sometimes when I switch messages, parts of the previous message are left behind (not refreshing properly). Are these issues that were resolved with the G-Whizz app? If so, this will help in my purchase of this app as I would like to have a better Gmail experience on my iPad. A few more questions about pop-up web windows. Is there buttons to move forward and back? How about opening the current page in Safari proper? Also, is offline access supported for gmail? @marty mankins: I don't think this app will correct those issues, unfortunately - those need to be fixed on Google's side. I've had occasional scrolling issues, too, but overall it's worked well. @Carlo Calica: Yes, there are buttons to move forward and back in the pop-up windows. Offline access is not currently supported by Gmail because Google has not enabled it for the Safari browser, yet. I hope to support it when they enable it! Ricky, thanks for the reply back. Good to know on the scrolling issues. For Safari, I switch to the standard Gmail interface (not the revised iPad default view) and all of the scrolling issues get resolved. 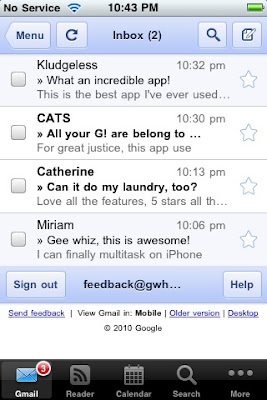 Does your app support switching the Gmail interface view? @marty mankins: The next version (currently in review) will offer this feature! I've had many requests! Will talk remain signed in while I'm in another 'tab'? Does it show an unread chats count, similar to how gmail has an unread email? Yes, Talk should remain signed-in. It doesn't yet show unread chats count, but we would like to add that! Thanks for your feedback! It's super critical for the millions of businesses using Google Apps to be able to connect a normal Gmail account and an Apps accounts at the same time. Of course, only one will be active at any given time but a button in the toolbar that allows us to switch between regular/work emails is super-important. Overall though, this app is awesome for regular Gmail accounts and I really hope you continue developing this well into the future. @Karim Baz: I agree completely. This is something would like to add in a future release. Thanks for your excellent feedback! To go a,ong with the above request, it'd be nice if I could choose which tab uses which account. This would be awesome for those of us that use multiple google accounts - for example, I'd like to have both my email accounts open. There does appear to be a bug with google apps for your domain accounts. When I click talk or buzz it opens up talk or buzz for gmail, not for my apps account. @evilim: Due to the way the browser handles logins, it's actually not possible to use multiple accounts at the same time, unless it's just the Apps account and your regular Gmail account. 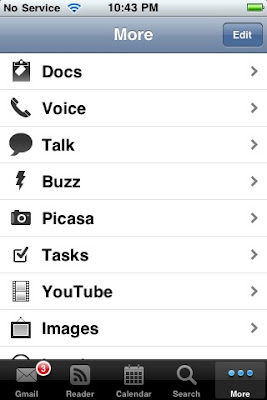 Regarding your second issue, I wasn't aware that Talk or Buzz were available for Apps accounts. That's just something we would need to add. Thanks for your feedback! Ricky, does this app support offline caching of reader content? I'd like to be able to use my wi-fi ipad to read my feeds while I am away from a network. Thanks! @Just the Four of Us: Offline caching is not yet supported because Google does not yet support this between browser sessions. Once they do, we hope to be able to support it also. Thanks for your feedback! Buzz isn't available for Google Apps, you're right, but Talk is. Yet Another Feature Request: I like how the browser window pops open if you click an external link (so it doesn't push you out of the app). While it's not a GApp, it'd be cool if instead of a modal-esque dialog it was instead its own tab, just like the other 'apps'. That way I could bounce between it and my email, talk, et cetera. We're planning on adding Talk support for Apps! Thanks! Some configurability of the application tabs would be great. Change order, hide ones I don't use. Stuff like that. @Carlo Calica: This is already possible. Just click on the "More" tab and then the "Edit" button in the top-right-hand-corner. You can then drag the icons from the top group into the spot on the bottom row where you would like them to be. You can essentially "hide" tabs by making sure they're not in the bottom row. Hope this helps! Ricky, can gwhizz app allow me to view an email which requires me to accept/ reject invitation to an event and subsequently update my google calendar/ iPhone calendar? Wish to know if I can add/edit/view my google calendar events as well. Through my default iPhone mail function, I am unable to view emails which request me to decide on accepting/ rejecting events update for calendar. @Yongle: I just tested this out myself and it seems to work just as you want it to! The invitation showed up properly and it appeared in my calendar after accepting it. Hope this helps! Great app! I have downloaded the app and is loving it! Keep it up Ricky and thanks! @Yongle: No problem! Glad you are enjoying the app! Please leave a review in the App Store if you have a minute. Thanks again for your input. A request Ricky :) can the app provide push notification for new emails? Also, I could not access my company webmail which is powered by google. Pls advise thank you! @Yongle: Could you send me an email at our support address from within the app? Thanks! How do I use this with Google Apps? It will not allow my user and password for Google apps, is there a setting I have somehow missed? @David: Go to the Settings app on your device and turn the setting for Apps to on and enter your email address. When you restart the program you should be prompted for your Apps email and password. Let me know if you have any problems by sending me an email via the G-Whizz! support email link from within the app. @David: No problem! Please leave a review if you're happy with the app! Thanks for your support! Can you make a call using the google voice in Gwhizz with the ipad? @charclyde: Yes! Right now you have to click on the link to open the Desktop version of Voice. In our next update we have an option to default to the Desktop version of Voice every time to avoid this step. Love the app. I need to talk with you. I've got ideas. 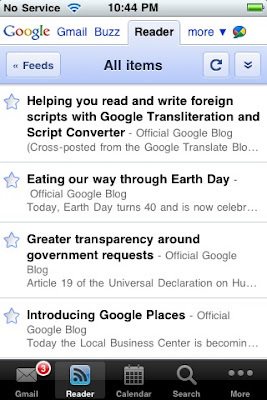 I have G-Whizz to read my google reader account and receive my gmail. It is locked with a screen that says unable to display this url with a done button at the top. I can press neither of these two. I have restarted the ipad and deleted all my account info and put it back in but I still get the blank url screen. How can I get rid of this? Thanks. I downloaded this app today [12-31-10] and for some reason the drag and drop function does not work while trying to rearrange the apps. I am using the previous version of the iPhone [not iPhone 4]. Can any one give me any ideas. 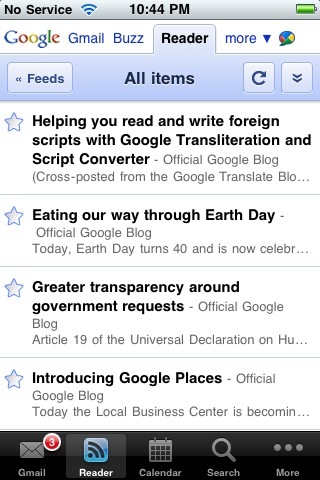 I don't use Facebook or Google Reader so I don't want those icons to show on my front screen. Can I edit docs and calendar offline? Can I creat new docs offline? And then have all sync later? I'm considering buying thanks. And same for gmail... Can I view and compose emails offline? This is an awesome app... but it is INCREDIBLY slow. Is it possible if you can fix that? How come in other gmail apps, mail gets pushed instantly to the iPad/iPhone, but with gwhizz, it has to be open to be notified of new mail? The chat tab is completely gone from the app in my IPhone and IPad. any suggestions on getting that feature back as that was the main one I used. Is there a copy paste feature planned for gwhizz? When I select a photo from the album browser in picasa, it remains a small thumbnail and then moves to the next photo. One would think it would open the photo in a larger viewable size. What's the deal with this? When I send someone a meeting invitation it sends it to them with the correct time however in the description it says "@Sat Apr 20 11pm - Sun Apr 21, 2013 3am" for a meeting on Apr 20 from 7 to 11pm. So the description is off by 4 hours even though if they accept the meeting it puts in into their calendar with the correct time. Any idea what is causing this ?